The painting "Markierung II" (Sign II) from 2017 was painted by Hartmut Kiewert with oil on canvas. With his paintings Harmut Kiewert addresses the relationship between non-human animals and humans. 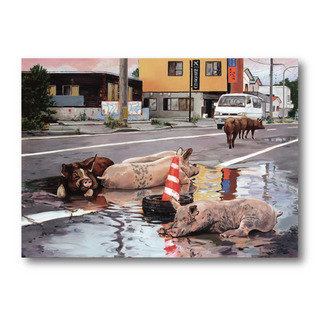 He tries to juxtapose the common view on animals with an entirely different one: A new perspective that recognizes animals as individuals, displaying forms of coexistence on equal terms and without oppression and violence. His paintings relativize the solely anthropocentric perspective and enable viewers to encounter these sentient social beings in new empathetic ways. Postcard "Wir verlassen die Erde"